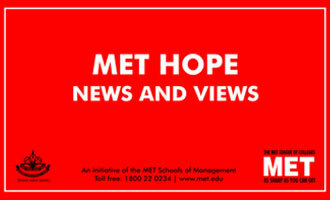 'MET HOPE – News and Views' was launched to offer MET management students a platform to discuss and debate the major events of the preceding week. It is to keep them up-to-dated with current events and their implications, attempting to chart a course for tomorrow as an answer to the events of today. This also enables students develop news analysis capability to forecast, predict and help build a long term perspective on the socio-economic future of the society.